Can electrochemically induced amalgam formation be used to remove mercury from water in an efficient way? There is a great need for new and improved methods to decontaminate water from toxic heavy metals and in this study, we examine the possibilities of removing mercury by formation of an electrochemical alloy with platinum. The process shows several important advantages compared to the techniques used today, including high selectivity, ability to clean down to very low concentrations, and that the electrodes can be regenerated. The story on this is published in Nature Communications. In this study, we present a first evaluation of the idea to use electrochemical alloy formation to decontaminate water from mercury. It has previously been shown that it is possible to form alloys of platinum and mercury, from mercury ions in solution and platinum metal on the cathode electrode in an electrochemical cell, but no reports have investigated the prospects of using this process to decontaminate water. For this, it is vital to know if the process is possible under realistic mercury concentrations, at different pH values, and in the presence of other ions and compounds. For practical use, it is also important to analyse how thick alloy films that can be produced and to what extent the electrochemical alloy formation is reversible so that the removed mercury can be taken care of in a safe manner and the precious and expensive platinum be reused. In order to address these questions, we designed a series of experiments to assess the fundamental properties of the electrochemical alloy formation for removal of mercury from aqueous solutions. We fabricated well-defined model electrodes, consisting of a 100-nanometre thick platinum film and with a controlled contact area to the mercury containing solution. This design lets us control the amount of platinum atoms on the electrode within about 1% accuracy. The mercury concentration in solution was evaluated by taking regular samples for analysis using inductively coupled plasma mass spectrometry (ICP-MS). A range of different initial concentrations of divalent mercury (Hg2+) in dilute nitric acid was evaluated. 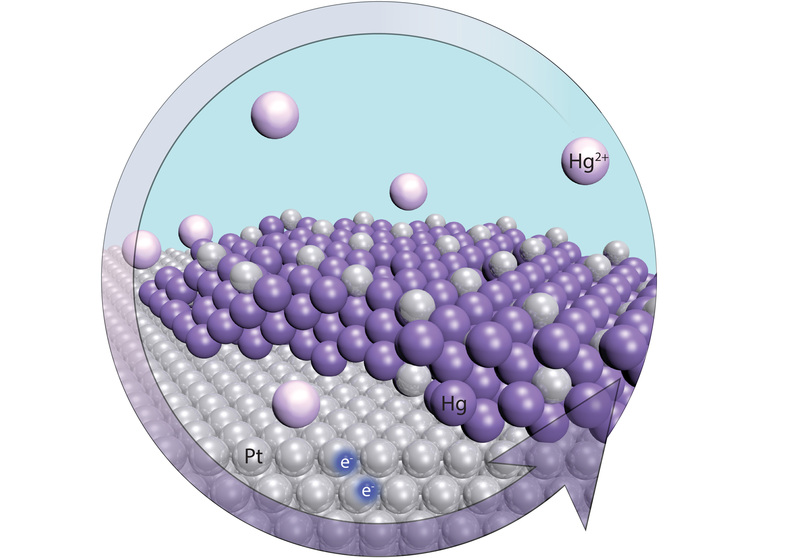 The electrochemical alloy formation leads to a preferential formation of the PtHg4 alloy phase, meaning that every platinum atom on the electrode can attract four mercury atoms. The results show that it is possible to completely transform 100 nm platinum to 750 nm PtHg4 and, as long as the total amount of mercury in solution is lower than four times the number of platinum atoms, the decontamination is highly efficient, removing more than 99% of the mercury in solution. For the lowest starting concentration, this imply that the process can clean water to at least an order of magnitude below the guideline value for safe drinking water set by the World Health Organization. By performing experiments in varying pH and in the presence of a range of different other ions than mercury, we saw that the process is unaffected by pH and very selective. The fact that the presence other ions does not affect the removal rate of mercury is specifically important for practical applications as contaminated waters typically contain a large number of compounds where mercury is often a very small portion. Once the platinum film has transformed into PtHg4, it is possible to remove the alloy film from solution and release the absorbed mercury in a controlled way by reversing the electrode potential, which also restores the platinum film for reuse. Our results open new possibilities for cleaner and more efficient methods to remove mercury in many applications, from treatment of industrial streams to natural waters. The method has a low energy demand and has notable advantages over traditional methods as it does not rely on chemical addition, it eliminates subsequent separation of any insoluble compounds, it is highly selective, it is easily regenerable, it is efficient in a wide pH range and it is highly effective at very low concentrations of mercury in solution. Our paper can be found here.